The O-CH1470 WG Holder from Ricoh securely cradles all Pentax WG-series cameras when mounted to any of the optional WG mount accessories. It's configured with a tripod screw for connection to the camera, as well as a strap that goes over the camera and features a wide opening in the middle, in order to prevent your WG from falling without blocking the built-in flash or LCD monitor. Thanks to the flexible ball and socket joint system used in these accessories, transferring the ball mount-equipped WG Holder to the Suction Cup, Adhesive or Handlebar Mount is quick and easy. 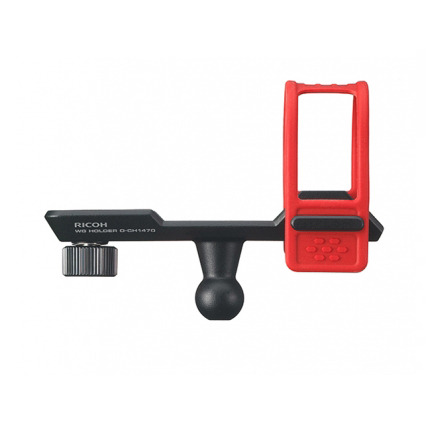 The holder enables precise adjustment of the camera, ensuring that you're able to capture the action shots for which these mounts were designed. The WG mounting plates are available separately.